Buford scored immediately behind Oconee County on the ACT scores, and Forsyth scored immediately behind Oconee County on the SAT scores. None of the school systems that outperformed Oconee County on the graduation rate comparisons had more than 253 graduating students in 2017. Oconee County had 549 graduates and had a graduation rate of 96.0 percent, up from 95.6 percent a year earlier. In other reports, administrators told the Board that construction for the new Dove Creek Elementary School in the far northwest of the county is on schedule and that the system has received close to 60 responses regarding the proposed redistricting plans for the new school. Superintendent Jason Branch also told the Board that he had determined that it will not be necessary to make up school days for Sept. 11 and 12, cancelled because of tropical storm Irma. Brook Whitmire, chief human resources officer for Oconee County Schools, told the Board that the community already has provided “helpful feedback” to the redistricting plan released to the public at the Board’s regular meeting on Sept. 18. The Board of Education will hold a special session starting at 6 p.m. on Tuesday at North Oconee High School, 1081 Rocky Branch Road at Hog Mountain Road, to provide community members additional opportunities to comment on the redistricting proposal before the Board. Whitmire is scheduled to present again information regarding upcoming redistricting for Dove Creek Elementary School, including proposed attendance lines. Under the plans, the parts of the Rocky Branch Elementary School District and of the Malcom Bridge Elementary School District northwest of U.S. 78 would become the Dove Creek Elementary School District. 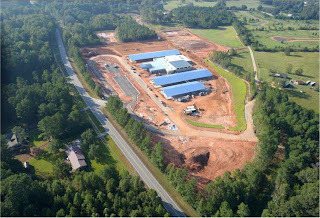 The school, on Hog Mountain Road between Osborne Road and Dewey Road near the Barrow County line, is scheduled to open Aug. 1. The Board of Education went into executive session following the work session Monday to discuss personnel. Anisa Sullivan Jimenez, director of communications for Oconee County Schools, sent out a news release on Wednesday morning announcing that Susan Stancil had been named principal of Dove Creek Elementary School effective June 1, 2018. Stancil has served as principal of Malcom Bridge Elementary since 2014. Jennifer Haygood, who has been assistant principal at Malcom Bridge Elementary since 2015, was approved to serve as principal at Malcom Bridge Elementary School, also effective June 1, 2018. Richard Coleman, assistant director of the Teaching and Learning Department for Oconee County Schools, gave the Teaching and Learning Report to the Board in the absence of Claire Miller, chief academic officer. Coleman told the Board that the average composite score on the ACT college entrance exam for the 326 Oconee County test takers in 2017 was 24.0, or just behind the 24.5 average score for Forsyth County Schools, which had 2,041 test takers. Bufford City Schools had a score of 23.9 with 164 test takers. The Georgia Department of Education had just released the high school graduation rates for school systems around the state, Coleman said, using data from students who started school in 2013-2014 and finished in 2016-2017. The Oconee County figure of 96.0 compares with a statewide figure of 80.6, Coleman’s report showed. The total mean score on the SAT college entrance exam for the 411 Oconee County test takers was 1,151, compared with the 1,157 for Buford City Schools and 1,146 at Forsyth County Schools. Buford had 185 test takers and Forsyth had 1,649 test takers. Superintendent Branch told the Board during his report that, after a review of state regulations, he had concluded that it will not be necessary to make up the days cancelled because of tropical storm Irma. If the School System has to cancel additional days as the year progresses, the issue will be addressed again, Branch said. Branch had told the Board at its meeting last month that he had anticipated not needing to make up the two days but wanted to study the issue further before giving a final determination. Whitmire began his report to the Board at 11:25 in the video and commented on the feedback on the redistricting plan starting at 13:48. Grant began his report to the Board at 15:25 in the video and updated the Board on the Dove Creek Elementary School construction at 17:48. Coleman’s report begins at 3:50 in the video. Branch’s report begins at 0:33 in the video. OCO: BOE 10 2 2017 from Lee Becker on Vimeo.